A sleek, floor-to-ceiling solution, Clear Wall divides and defines space beautifully. Trendway has been in the movable wall business for over 50 years. 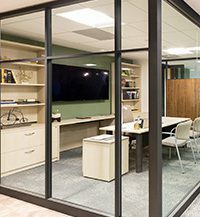 The three Movable Wall Systems – TrendWall, Volo and Clear Wall – represent a full range of pricing, function and aesthetics. All three can seamlessly combine to create unique solutions that meet budgetary and functional requirements. Download our full binder to learn how we can help you with your next project. What is the approximate size of your project in square feet? Are you looking at utilizing moveable walls instead of drywall construction?